On Wednesday the Mountain West Conference announced their all-Mountain West teams. The All-Mountain West teams is awarded to the top players at their position. 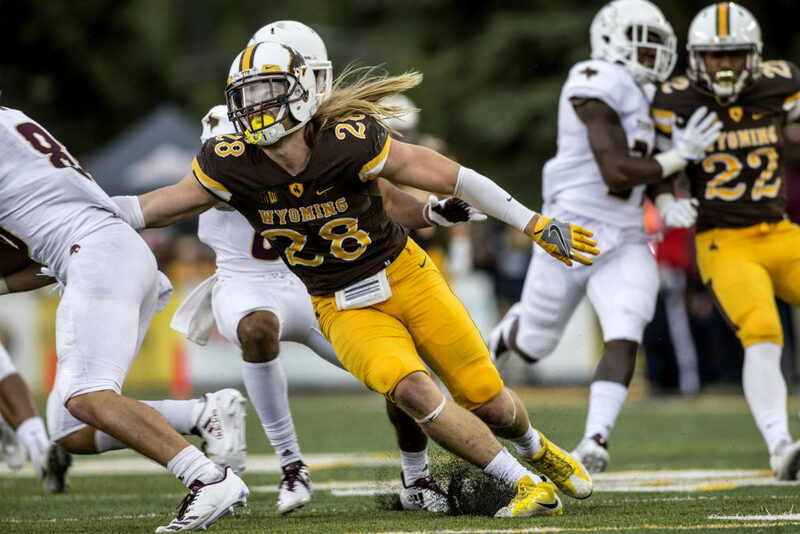 Seven Wyoming Cowboys made the list at their respective positions. The awards are voted on by the media and the coaches of the Mountain West. Three Cowboys defensive players were honored on the first team, the first time Wyoming has accomplished that since joining the Mountain West. Junior safety Andrew Wingard made the first team for the second consecutive season. Joining him on the first team are defensive tackle Youhanna Ghiafan and defensive end Carl Granderson. On the second team were sophomore linebacker Logan Wilson and senior corner Rico Gafford. Logan Wilson was the Mountain West’s freshman defensive player of the year last season. As for the honorable mention selections are junior quarterback Josh Allen and sophomore returner Tyler Hall. This is Josh Allen’s second time being named to the list, last year he was second team all-conference. Andrew WIngard, Safety, Arvada, CO – 111 tackles, 67 solo tackles. Seven tackles for loss. Four interceptions, three pass break-ups. This is Wingard’s second straight selection to the All-Mountain West team. Andrew Wingard finished 25th in the country in tackles, tying his teammate Logan Wilson. Wingard averaged 9.25 tackles per game. Youhanna Ghaifan, Defensive Tackle, Grand Island, NE – 64 tackles, 37 solo tackles. Thirteen tackles for loss, five sacks. Ghaifan finished 50th in the country in tackles for loss, averaging 1.8 per game. This is his first appearance on the all-conference list. Carl Granderson, Defensive End, Sacramento, CA – 72 tackles, 32 solo tackes. Eight and a half sacks, 15 tackles for loss. Two interceptions. Granderson finished 27th in sacks nationally, and 23th nationally in tackles for loss nationally. This is his first appearance on the all-conference list. Logan Wilson, Linebacker, Casper, WY – 111 tackles, 71 solo tackles. One sack, eight tackles for loss. His 111 tackles were good enough for 25th in the country, tying teammate Andrew Wingard. Rico Gafford, Defensive Back, West Des Moines, IA – 41 tackles, 28 solo tackles. Four interceptions, six pass break-ups. Gafford’s four interceptions were 41st nationally. This is his first appearance on the all-conference list. Josh Allen, Quarterback, Firebaugh, CA – 141/251 for 1658 yards with 13 touchdowns and six interceptions. Eighty-four rushes for 368 yards and five touchdowns. Allen is expected to declare for the NFL draft following the conclusion of the season. He has not played in two and a half games due to a shoulder injury. He led three fourth quarter comebacks this season for the Pokes. This is his second trip to the all-conference list. Tyler Hall, Kick Returner, Hawthorne, CA – Thirteen kick returns for 34.5 yard average, two touchdowns. One interception, 27 tackles, 16 solo tackles. Hall is the first Cowboy to ever take two kick returns back for touchdowns in the same season. Hall led the Mountain West, and was fourth nationally in kick return average. In other Mountain West Conference awards, the offensive player of the year was San Diego State’s Rashaad Penny. Penny was also named special teams player of the year as well. Penny leads the nation in rushing with 2027 yards, averaging 168.92 yards per game. The defensive player of the year was Boise State’s Leighton Vander Esch. Vander Esch was third in the league in total tackles with 114. The Mountain West’s freshman of the year was UNLV quarterback Armani Rogers. The coach of the year was Fresno State’s Jeff Tedford. Air Force: Grant Ross, Sr., LB. Boise State: Ezra Cleveland, Fr., OL; Haden Hoggarth, Jr., PK; Alexander Mattison, So., RB; Tyson Maeva, So, LB; Durrant Miles, Jr., DL; John Molchon, So., OL; DeAndre Pierce, So., DB. Colorado State: Evan Colorito, Sr., LB; Dalton Fackrell, Sr., TE; Trae Moxley, Sr., OL; Ryan Stonehouse, Fr., P; Josh Watson, Jr., LB. Fresno State: Mike Bell So., DB; Jaron Bryant, So., DB; Christian Cronk, Jr., OL; Malik Forrester, Sr., DL; George Helmuth, Jr., LB; Juju Hughes, So., DB; Marcus McMaryion, Jr., QB; Netane Muti, Fr., OL; David Patterson, Sr., OL; Micah St. Andrew, Jr., OL; Robert Stanley, Sr., DL. Hawai‘i: Meffy Koloamatangi, Sr., DL; Viane Moala, So., DL. Nevada: Ty Gangi, Jr., QB; Sean Krepsz, Jr., OL; Austin Paulhus, Sr., LB; Asauni Rufus, Jr., DB. New Mexico: Blaise Fountain, Sr., OL; Garrett Hughes, Sr., DL; Aaron Jenkins, Jr., OL; Jake Rothschiller, Sr., DB. San Diego State: Parker Baldwin, Jr., DB; Mikah Holder, Sr., WR. San José State: Bryce Crawford, Jr., PK; Chris Gonzalez, Sr., OL. UNLV: Nathan Jacobson, Jr., OL; Kyle Saxelid, Sr., OL. Utah State: Roman Andrus, Jr., OL; Quin Ficklin, Jr., OL; Dallin Leavitt, Sr., DB; Dax Raymond, So., TE. Wyoming: Josh Allen, Sr., QB; Tyler Hall, So., RS.